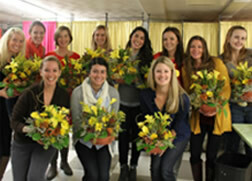 The Professional Florist Training Program and the Advanced Design Program provide comprehensive floral career training for students interested in becoming professional floral designers. These workshops provide an introduction to floral design for students who want to learn how to arrange flowers for their own enjoyment and use. Cass School of Floral Design was established over 30 years ago and has taught thousands of people the wonderful art of floral design. Faith Cass, the Director of the School, is a second generation florist and a member of the American Institute of Floral Designers (AIFD) the most selective and prestigious professional floral design association in the United States. The Cass School of Floral Design offers a wide range of floral education including comprehensive floral career training, workshops on dozens of topics for students who want to learn flower arranging for their own enjoyment and private classes for individuals, groups and businesses.